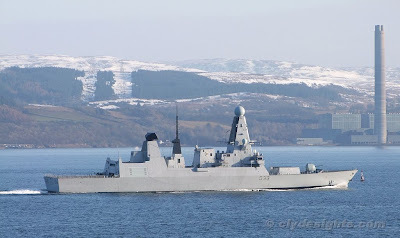 The second of the new Type 45 air defence destroyers sailed from Faslane on Sunday afternoon, having spent a few days back on the river that she was built upon. DAUNTLESS was formally commissioned into the Royal Navy at a ceremony in Portsmouth on 3rd December last year. DAUNTLESS is affiliated with the City of Newcastle.